Organize with ease! The durability, modularity, and simplicity of the 4 Shelf Cabinet makes it the ideal solution for basements, attics and garages. 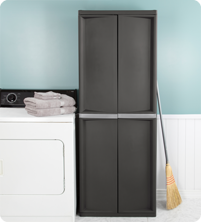 The trend forward Flat Gray color is both sleek and refined and complements a variety of living areas, offering additional storage options for pantries, utility /laundry areas, dorms and mudrooms. The 4 Shelf Cabinet features doors that swing open easily, close securely and can accommodate a standard padlock. 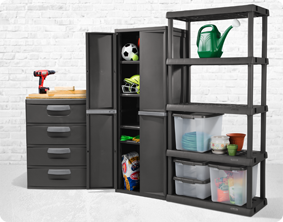 With four rugged adjustable shelves to optimize your storage space - ideal for organizing painting, gardening, car supplies, laundry essentials, sporting gear, and workshop items. Heavy duty plastic will not dent, chip, peel or rust, ideal in a challenging environment. 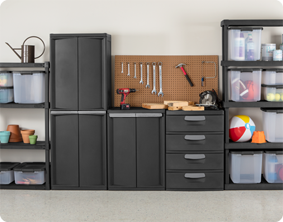 The Cabinet assembles easily in minutes without the use of tools, simplifying your organizational project. Create a custom storage solution with our other Hardware items, such as the 5 Shelf Shelving Unit, 4 Shelf Shelving Unit, and 4 Drawer Unit. The overall dimensions of this item are 25 5/8" x 18 7/8" x 69 3/8". Overall Assembled Size: 25 5/8" x 18 7/8" x 69 3/8"